If you take one peek in my closet, first I would tell you to get the heck out of there (it’s messy), and then you would notice I have a thing for handbags. I have three I rotate regularly these days (here, here and here), but I’ve found a brand of handbags via a UK designer that I must get my hands on asap. I’m talking about Brit-Stitch. A line of handbags from a UK designer who’s been crafting exquisite leather satchels since 1967. Now, thanks exclusively to ModCloth, we can grab one of these in the states! They have a wide array of colors, sizes and shapes, plus there’s a look to go with every style. I chose three of the nine handbags and created outfit ideas around them. This first outfit I would wear over and over and over again. This gorgeous bag is the Pretty Between Cities Bag in Vermilion. I love the color and the style and it really pops against an olive green jacket. I like the classic look of a striped shirt and blazer, plus mixing stripes and floral. This outfit covers both! 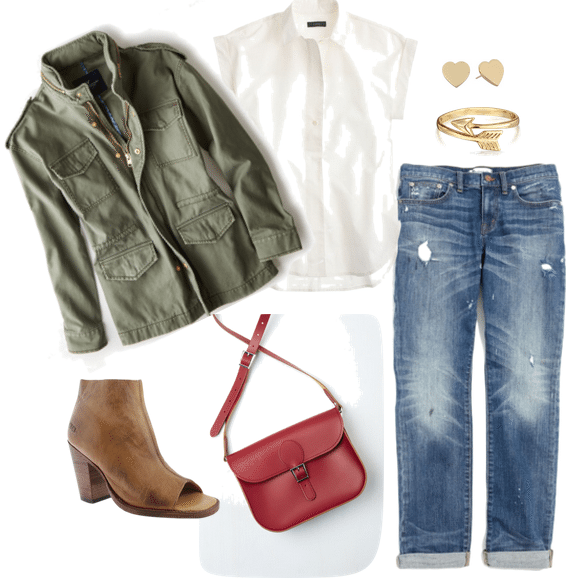 This is my idea of a perfect outfit for fall. The Brit-Stitch handbag featured here is the Pretty Between Cities Bag in Mocha. 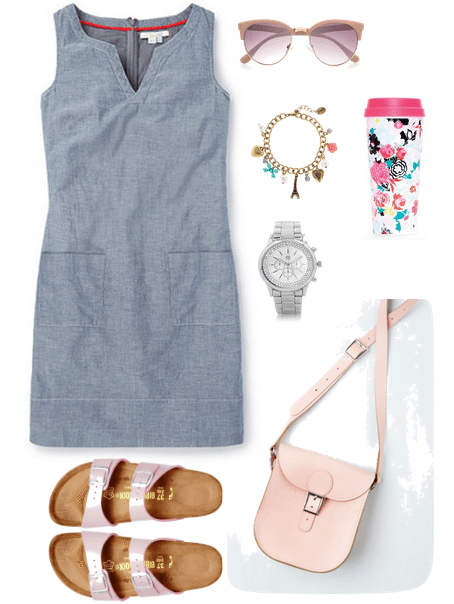 Have chambray dress, will travel. That’s my motto. I really like traveling in a comfortable dress, especially a chambray one. Add a pair of Birks, travel mug in hand and you’re ready to hit the road. The Brit-Stitch bag featured here is the Tasteful in Transit Bag in Blush. See the rest of the gorgeous Brit-Stitch bags here. Which outfit idea and bag is your favorite? Previous articleThe Nordstrom Anniversary Sale – Huge Savings!